Today’s story isn’t about a specific medical condition resolved or weight loss accomplished; it’s about finally feeling like you’re in control of the food you’re eating for the first time in a long time, and the kind of self-confidence and empowerment that brings. 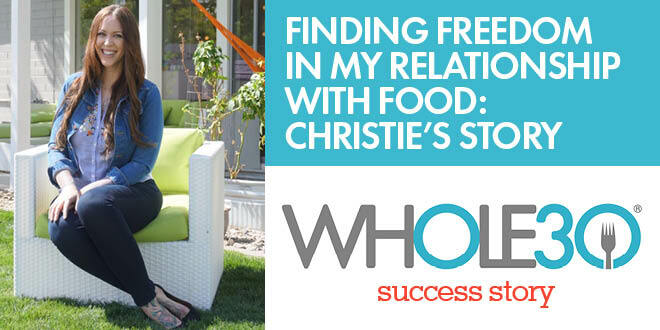 We read Christie’s story, and immediately knew nearly everyone in our community could relate to some degree. I truly excel at gaining and losing weight — I’m very good at both, and you could safely say I have a lot of experience with diets. You name it, I have probably tried it. In the past, I experienced impressive weight loss several times with some well-known weight loss companies, but I wasn’t healthy, not by a long shot. Friends and family looked at me as a role model and inspiration, and I may have looked “thin,” but my insides were not happy. I still binge ate when I could—sugar and I were the closest of friends. Having practiced thinking of food as “good” and “bad” my entire life, I didn’t think there was a way I would ever break those habits. The way I perceived food was not healthy emotionally or physically. I used food, and junk food especially, as a coping mechanism, truly eating my feelings. I found unhealthy ways to work around all of my diets and, over time, I honed my “shady dieting skills.” When I had a difficult or stressful day, I would turn to food to provide the comfort I needed. Then I started seeing Dr. Courtney Hunt, an OB-GYN who helped at least a dozen people I know—women and men—feel their best naturally. Seeing Dr. Hunt was one of the best decisions I ever made; she’s been an amazing asset to my recovery. During an intake of my symptoms and moods, she asked me how I would characterize my eating. I immediately ‘fessed up to regularly binging on sugary treats and any other unhealthy food. I told her that if I could survive and thrive on donuts, my life would be perfect. Dr. Hunt asked me if I would be willing to do a Whole30 in addition to the protocol she planned for me. Under doctor’s orders, I committed to a program that required 100% compliance—I knew I wouldn’t be able to skirt the rules. Dr. Hunt was my biggest source of accountability. 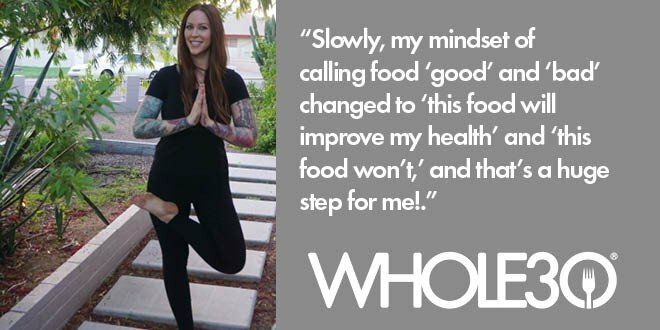 Her faith in using diet to heal was powerful, and after reading It Starts With Food and The Whole30, I was a believer, too. Whole30 gave me the opportunity to pause and get my food-related issues in check. 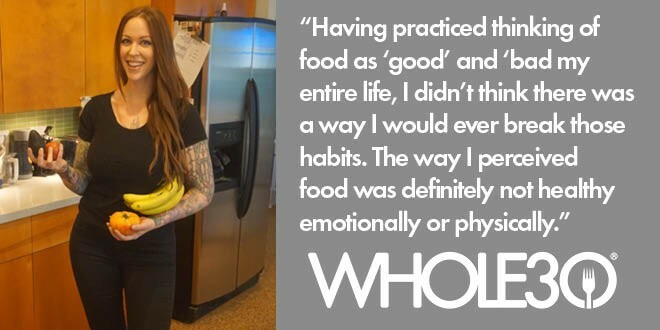 Slowly, my mindset of calling food “good” and “bad” changed to “this food will improve my health” to “this food won’t.” I got off of off the emotional roller coaster I was on with food and started mindfully making great decisions about what I put in my body. I’ve never had this kind of insight about my health before; I used to only focus on what I saw in the mirror, and truly never anything else. What helped me stay compliant was how different I felt almost immediately after beginning the Whole30. I knew these were changes that I could find sustainable in the long run. Since my Whole30, I’ve returned to healthy hobbies that make me feel wonderful, like hiking, yoga, and spending quality time with loved ones. I received more motivation and encouragement from friends and family than I could have ever imagined! I look healthier than I have in a very long time, and it doesn’t go unnoticed. The best part about the Whole30 is you don’t need to join anything, spend money on a program, weigh in, or count calories. The freedom to just let nature do its work is pretty rad. I will totally complete another round again soon, and in the meantime, I will start peppering in some of my old favorite foods on a case-by-case basis and gauge how they make me feel. My mind and body are thriving; the Whole30 changed my life and I am so grateful to have found it.